Last month we carried out an experiment. We wanted to see if we brought together a small carefully selected group of people into a fun and interactive, co-creation process, could we come up with concrete ideas on how tech can help achieve the SDGs by 2030. The answer was a resounding yes! 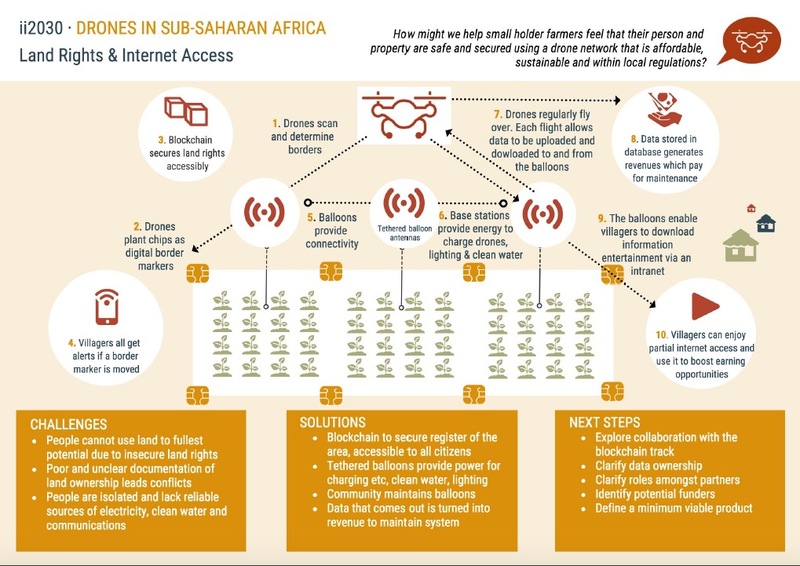 The drone track at ii2030 brought together 15 experts to answer the question: How might a multifunctional drone network help to deliver essential products and services in remote areas across Africa? The result was the three ideas illustrated below that will ultimately be connected to create an affordable multi-functional drone platform that local entrepreneurs and other actors can tap into to increase their impact and bring us closer to achieving the SDGs. What did we do at ii2030? We banned powerpoint presentations! On day one, we hopped on a bus to a “bring your own drone” stop where participants shared the latest on what drones can do and where the technology is going. This was followed by a virtual reality stop where we saw part of the daily life of a small holder farmer in rural Kenya. We had a lively discussion on what needs to be done to ensure the technology is appropriate, affordable and sustainable in places like the one we “visited”. On day two, we used IXDS’ design thinking process to focus and come up with concrete ideas for drones doing good and explore possible partnerships. What came out of the event? Our participants were split into 3 groups and the following ideas emerged from each group. They are early stage and a starting point for further discussions and testing. 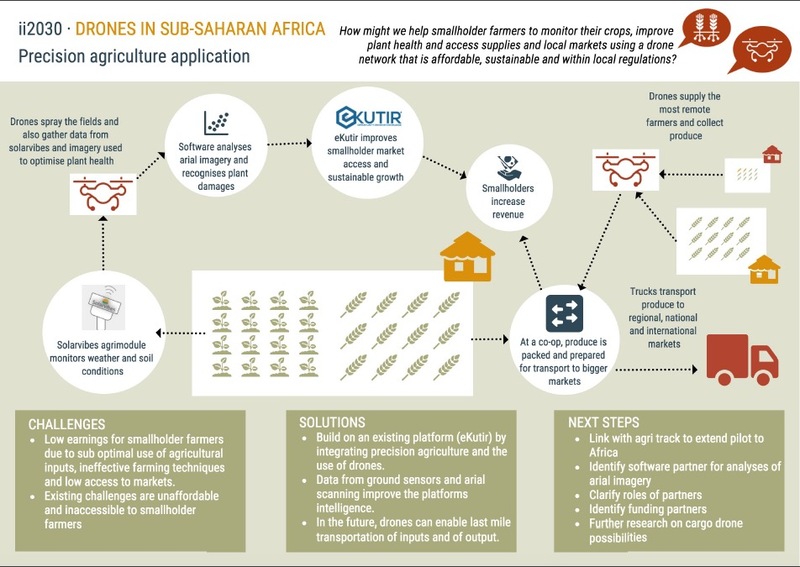 Using a combination of blockchain, tethered balloons and drones, smallholder farmers gain access to a publicly accessible register of land rights in their area and a local intranet that allows them to expand business activities through online marketplaces. In the coming weeks, we look forward to narrowing this down to a concrete minimal viable product to be tested. 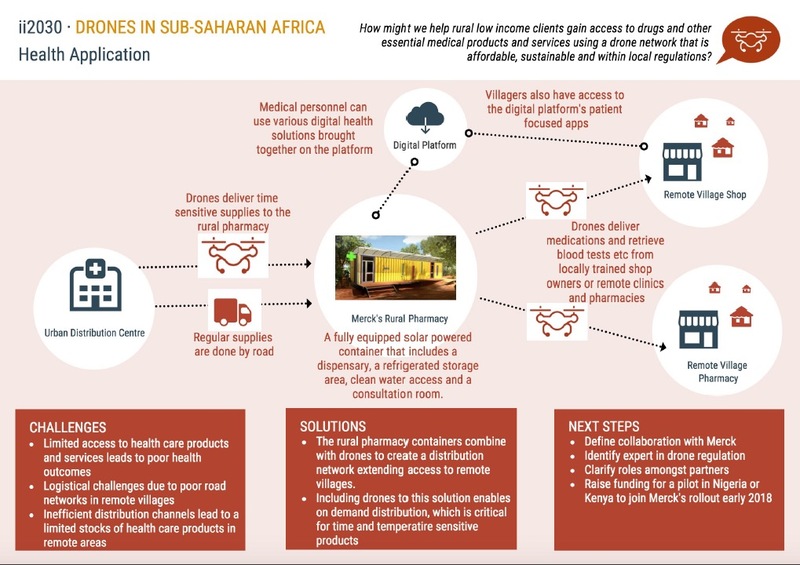 Here, we build on the roll-out of Merck’s rural pharmacy to see if villages nearby can be reached using drones to cover the last mile. Drones can also serve to resupply the rural pharmacies when they need time sensitive stock. True to ii2030 spirit of collaboration, this idea merges with the precision agriculture track that seeks to increase the impact of eKutir’s small holder program by integrating precision agriculture. Drones collect data from ground sensors provided by Solarvibes and aerial imagery that can be used to optimise plant health. Furthermore, this idea explores options to use drones for last mile transportation to the most remote small holders, thereby connecting them to local, regional and global markets. Our next challenge will be to build on this momentum and start to test and iterate on these ideas. Our vision is that by 2030 our drone network will be having impact at scale and on the path to financial sustainability. Since the event our group is continuing to meet. We are breaking down the ideas into smaller pieces. Our aim is to start testing and iterating based on implementation on the ground. Through an iterative process we will steadily learn and build up the ideas. We know that from a technological perspective much is feasible, however for this technology to be truly impactful we will need to find ways to ensure affordability and sustainability. Watch this space for further updates! About the authors: Mariska Van Gaalen is an Associated Expert at Endeva and Tendai Pasipanodya is a Director at Endeva. They organised the “Drone delivery in Africa track” at ii2030. This track was sponsored by Airbus’ Aerospace Accelerator, Airbus BizLab.